Published on 12 December 2017 by Fight Racism! Fight Imperialism! On 8 November 2017, the United States government launched new sanctions against Cuba, releasing an updated list of Cuban entities – from hotels to agricultural suppliers and from soft drinks to retail stores – which US businesses and citizens are banned from engaging with. What do they have in common? The US Department of State list states that they are all ‘entities and subentities under the control of, or acting for or on behalf of, the Cuban military, intelligence, or security services or personnel with which direct financial transactions would disproportionately benefit such services or personnel at the expense of the Cuban people or private enterprise in Cuba’. Jack Lukacs reports. It is an untenable proposition to distinguish between civilians and the military in a revolutionary state under siege. By attempting to starve the Cuban government of revenue from travel, remittances and trade, these measures hurt all Cubans on the island. Trump appears to be dancing to the tune of his key electoral allies in Florida, Miami. Extreme right-wing Cuban-American Senators Marco Rubio and Congressman Mario Díaz-Balart are the architects of the ban on transactions with military-linked enterprises. But they are not easy to please. Following the publication of the State Department’s list, they complained that it was too short because US ‘bureaucrats’ were ‘refusing’ to carry out Trump’s policy. The sanctions are the latest move to reverse the limited rapprochement between the two countries undertaken in the last two years of Obama’s administration. They follow the withdrawal of 60% of the US embassy staff in Havana in September 2017, and the corollary expulsion by US authorities of 60% of staff in the Cuban embassy in New York. The pretext for this withdrawal of personnel was the bizarre allegations of so-called ‘acoustic’ or ‘sonic’ attacks against US diplomats stationed in Cuba. Cuba has flatly denied any involvement with any aggression against foreign diplomats. The ‘acoustic illusion’ is traced back to November 2016, shortly after Trump’s election victory, when US diplomats and their families apparently experienced a broad range of symptoms which had no known cause. It was not until 17 February 2017 that the US Embassy in Havana and the State Department notified the Cuban Ministry of Foreign Affairs of the alleged symptoms sustained since the previous year. In response, Cuban authorities immediately set up a high priority investigation and took measures to tighten security and ensure the safety of those diplomats. Cuban investigators included experts in acoustics from the Ministry of Science, Technology and the Environment, ear specialists from the Public Health Ministry and officials from the Ministry of the Interior. They set out to investigate the source of the complaints. Logically, Cuban authorities sought cooperation between the US embassy in Havana and the Cuban Diplomatic Security Department. The Cuban government invited the FBI to Havana to collaborate on the investigation and analysis. But US authorities were reluctant. They delayed the provision of information and personnel to clarify the data they had collected. What they sent was insufficient. A diplomatic note was issued by the US State Department suggesting that the alleged symptoms experienced by US diplomats, including nausea, dizziness, pain, hearing impairment, and even brain damage, were caused by long-range acoustic equipment. No evidence or other data were offered. Cuban authorities were denied access to the alleged victims and their statements. Despite the allegation of health injuries, no officials of the US embassy had visited any Cuban healthcare centres to seek treatment for their symptoms – US diplomats routinely use Cuban health services. Nor did any other resident living near the diplomatic residences, where the attacks are alleged to have taken place, report or seek medical assistance for the symptoms associated with a sonic attack. Hearing loss can only be caused by audible noise, at a very loud level, yet in interviews with Cuban neighbours of the diplomatic residences there were no reports of hearing any anomalous sounds. Thorough health examinations were performed on these witnesses and no cases of auditory trauma could be found. The Cuban specialists took sound samples in these areas but no evidence was found of noise levels that could cause harm. Eventually, US authorities provided sound samples which they alleged were recorded during the alleged attacks. These samples revealed noise levels of around 74 decibels, considerably lower than the 90 decibels of sustained noise that would be required to cause damage to hearing. The noises in the samples did bear significant similarities to those made by cicadas (noisy insects). Telecommunications engineer Molina Campos explained that the investigation ‘applied the same digital processing techniques used on the audio samples we received to the cicada sounds we recorded. The result was that this sound is above 7 kilocycles, with an approximate bandwidth of 3 KHz, and very similar in terms of audition. We also compared the spectrum of all the signals provided with the spectrum we recorded and, obviously, the noise is very similar to that produced by a cicada.’1 The technology capable of directing acoustic attacks on individuals is not present in Cuba, and it is illegal under Cuban law to import a device with such capabilities. To date, the creation of loud noises by cicadas has not been subject to legislation. The first press report of the ‘sonic attacks’ appeared in CNN on June 2017.2 It cited a US government ‘official’ saying they were cooperating with Cuba and investigating whether a third country was responsible, as ‘payback’ for US actions elsewhere and to ‘drive a wedge between the US and Cuba’. The favourite bogeyman was, of course, Russia. But Cuba’s enemies have attempted to directly accuse the Cuban government, or suggested a ‘dissident’ sector in the Cuban military are responsible. Even without evidence or the conclusion of the investigation, the political attack has been launched. The Trump administration is brazenly asserting that, whether or not responsible, Cuba is to blame for unverified cases of illness, caused by illusory and improbable technology; and is using that assertion to deliberately weaken the relationship between the two countries, as well as to promote its reactionary propaganda against the socialist country. Evidently, the US government is less interested in validating its own claims than using them as a public justification for sanctions and the erosion of tenuous bilateral relations. The withdrawal of 60% of the US embassy staff from Havana leaves only a bare-bones staff of ‘emergency personnel’. The move was accompanied by the issuing of an advisory to US citizens against travelling to Cuba – a harsh blow to the Cuban economy. Last year some 650,000 US citizens visited Cuba without a single incident, and Cuba is one of the safest countries in the world for US tourists. The US embassy is no longer issuing visas to Cubans for travel to the United States, whether for temporary visits or migration purposes. Millions of Cubans have family members in the United States, and this will hurt on both sides of the Florida Straits. Now, to receive a visa, Cubans will have to travel to a third country, such as Colombia, in order to apply. Despite the extra costs, there is no guarantee the application will be successful. This is prohibitive for most families, a clear and deliberate attempt to reverse reconciliation and increased interaction between the two countries. It signifies a return to open hostility, the default US stance towards Cuba since the Revolution of 1959 liberated the island from imperialist exploitation. This reversal was possible, as although Obama had toned down overt aggression towards Cuba, the strategy of regime change remained the same. Trump is a dog with a different bark. After six months of anticipation, Trump’s new Cuba policy was initiated in June 2017 in a speech to powerful Miami-Cubans, promising to further restrict trade and travel between the US and Cuba (see FRFI 259). It is another example of Trump showing the middle finger to the rest of the world. The 8 November sanctions came one week after 191 countries in the United Nations General Assembly once again voted in favour of Cuba’s motion condemning the US blockade. In 2016, after the restoration of diplomatic relations with Cuba, Obama’s administration had abstained in the UN vote for the first time ever – along with its erstwhile ally Israel. This year, however, the US and Israel returned to oppose the motion. Recent surveys also show that most Cuban-Americans want the blockade to be lifted. Cuban authorities point out that they have never allowed an attack on US diplomats or citizens to take place on its territory. Contrast this to the over 150 recorded attacks on Cuban diplomatic missions in several countries, including the assassination of UN attaché Felix Garcia Rodriguez in New York in 1980. As Cuban Foreign Minister Bruno Rodriguez declared to the UN General Assembly on 1 November, in the light of the US’s growing inability to control public opinion, and in recognition of the strength of Cuban resistance to isolation, sabotage, terrorism and sanctions, any attempt to undermine the Cuban Revolution is ‘doomed to failure’. 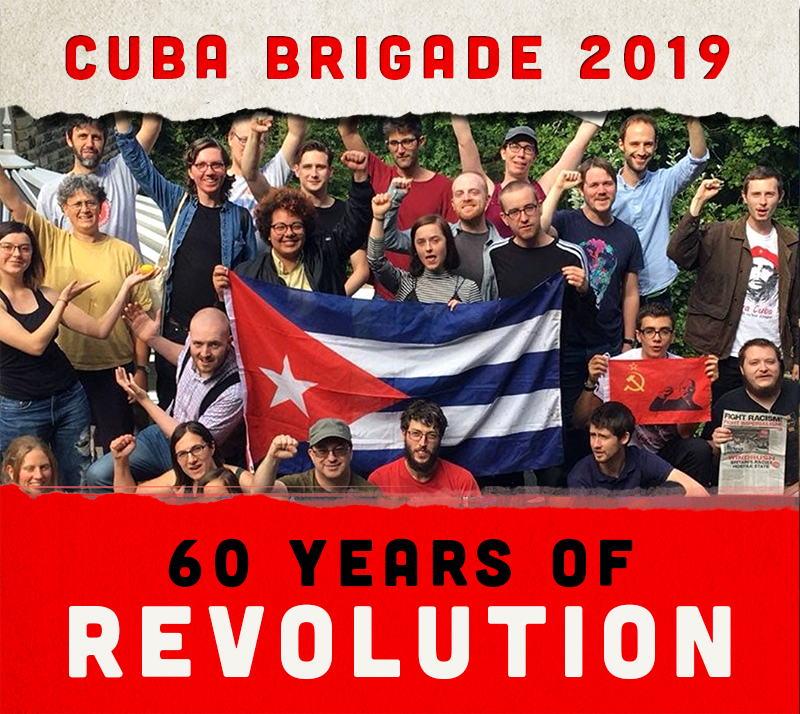 Cuba has withstood decades of attacks and propaganda and remains undefeated, its human-centred development showing that socialism is the only way forward for humanity.